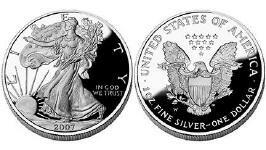 United States proof coins are extraordinarily brilliant with sharp relief and a mirror-like surface. Their frosted, sculpted foregrounds give them a special "cameo" effect, created by the exacting proofing process. Proof blanks are specially treated, polished, and cleaned to ensure high-quality strikes. The blanks are then fed into presses fitted with hand-polished dies and struck at least twice to ensure a sharp, high relief. The coins are then packaged in presentation cases to showcase and maintain their exceptional finish. From the very beginning of coin making, proof coins have represented the highest level of the craft. The term "proof" really refers to the manufacturing process by which the coin is made. The result of the process used by the United States Mint is a coin that is distinguished by a frosted cameo image and a brilliant mirror-like background. These coins are so beautiful that many people think of them as miniature works of art. The term "Proof" refers to a method of manufacture which produces a superior quality coin. Proofs are struck on specially prepared planchets using highly polished dies. They are struck multiple times at low speed and are made expressly for collectors in Proof Sets. Modern Proof coins are easily identified by their mirror-like finish and frosted features. The method for making a proof coin starts out as it does for any other coin: A United States Mint sculptor-engraver begins by sculpting a clay model of the coin design. Plaster is poured over the clay model, forming a negative plaster model. After the model is approved, a negative rubber mold is made and epoxy is poured into it to create an extremely durable model. The epoxy model is mounted on a machine called a transfer-engraver, which creates a “master hub.” Through a series of manufacturing processes, steel dies are then made. From this point on, the procedure differs from the process used to manufacture coins for general circulation. With proof coins the dies are given a special finish. A distinct feature of U.S. Mint proof coins is the two-tone surface consisting of a lightly frosted image against a shiny, mirror-like background. This effect is accomplished by a unique method of sandblasting and polishing different areas of the dies that are used to strike proof coins. Proof coins are also famous for the raised detail of the image (known as relief). The raised detail is achieved by striking a highly burnished die, not once but at least two times, in a lower speed coin press. The coins are then packed in acrylic cases to showcase and preserve their exceptional finish. In contrast, coins manufactured for general circulation are struck only once using high-speed presses. Low mintages for the Barber Dime, Quarter and Half Dollar assure that no more than 250 sets of U.S. Proof coins of 1909 could ever have been assembled. This exciting year included both Indian and Lincoln Cents, Liberty Nickel, and three Barber Silver coins. Although mintages for individual coins may be higher, no more than 551 sets composed of the Lincoln Cent through the Barber Half Dollar could ever have been assembled, and far fewer survive today in all states of preservation. Cent, Nickel, Dime, Quarter, and Half Dollar. Cent, Nickel, Dime, Quarter, and Half Dollar plus a Silver War-time Composition Nickel. Cent, Nickel, Dime, Quarter, and Half Dollar. The mintmark is missing from the Dime. Cent, Nickel, Dime, Quarter, and Half Dollar. In extremely rare instances, the mintmark is sometimes missing from the Dime. Cent, Nickel, Dime, Quarter, and Half Dollar. Sometimes, the mintmark is sometimes missing from the Nickel. Cent, Nickel, Dime, Quarter, Half Dollar, and Clad Eisenhower Dollar. Cent, Nickel, Dime, Clad Bicentennial Quarter, Clad Bicentennial Half Dollar, and Clad Bicentennial Dollar. Cent, Nickel, Dime, Clad Bicentennial Quarter, Clad Bicentennial Half Dollar, and Clad Bicentennial Dollar. The mintmark is missing from the Dime. Bicentennial Quarter, Bicentennial Half Dollar, and Bicentennial Dollar. Cent, Nickel, Dime, Quarter, Half Dollar, and Eisenhower Dollar. Cent, Nickel, Dime, Quarter, Half Dollar, and Anthony Dollar. The mintmarks on these coins may or may not be clear. Cent, Nickel, Dime, Quarter, Half Dollar, and Anthony Dollar. All coins must have clear mintmarks. Cent, Nickel, Dime, Quarter, Half Dollar, and Anthony Dollar. Cent, Nickel, Dime, Quarter, Half Dollar, and Los Angeles XXIII Olympiad Dollar. Cent, Nickel, Dime, Quarter, Half Dollar, and Los Angeles XXIII Dollar. Cent, Nickel, Dime, Quarter, Statue of Liberty Half Dollar, and Statue of Liberty Dollar. Cent, Nickel, Dime, Quarter, Half Dollar, and Constitution Bicentennial Dollar. Cent, Nickel, Dime, Quarter, Half Dollar, and Olympiad Dollar. Cent, Nickel, Dime, Quarter, Half Dollar, Clad Bicentennial of the Congress Half Dollar and Silver Bicentennial of the Congress Dollar. Cent, Nickel, Dime, Quarter, Half Dollar, and Eisenhower Centennial Dollar. Cent, Nickel, Dime, Quarter, and Half Dollar. The mintmark is missing from the Cent. Cent, Nickel, Dime, Quarter, Half Dollar, and Eisenhower Centennial Dollar. The mintmark is missing from the Cent. Cent, Nickel, Dime, Quarter, Mount Rushmore Golden Anniversary Half Dollar, and Mount Rushmore Golden Anniversary Dollar. Cent, Nickel, Clad Dime, Clad Quarter, and Clad Half Dollar. Cent, Nickel, Dime, Quarter, Olympiad Half Dollar, and Olympiad Dollar. Cent, Nickel, Silver Dime, Silver Quarter, and Silver Half Dollar. Cent, Nickel, Dime, Quarter, Madison Half Dollar, and Madison Dollar. Cent, Nickel, Dime, Quarter, World Cup Half Dollar, and World Cup Dollar. Cent, Nickel, Dime, Quarter, Civil War Half Dollar, and Civil War Dollar. Cent, Nickel, Dime, Quarter, Olympic Half Dollar, and Olympic Dollar. Cent, Nickel, Dime, Quarter, Half Dollar, and Botanic Dollar. One case contains the Cent, Nickel, Clad Dime, and Clad Half Dollar. Another case contains one each of the five 50 State Quarters, all Clad: Delaware, Pennsylvania, New Jersey, Georgia, and Connecticut. Packaging: Two hard plastic cases inserted into specially printed sleeves and accompanied by a Certificate of Authenticity. One each of the five 50 State Quarters: Delaware, Pennsylvania, New Jersey, Georgia, and Connecticut. Packaging: A hard plastic case inserted into a specially printed sleeve and accompanied by a Certificate of Authenticity. One case contains the Cent, Nickel, 90% Silver Dime, and 90% Silver Half Dollar. Another case contains one each of the five 50 State Quarters, all 90% Silver: Delaware, Pennsylvania, New Jersey, Georgia, and Connecticut. One case contains the Cent, Nickel, Clad Dime, Clad Half Dollar, and the new Sacagawea "Golden Dollar." Another case contains one each of the five 50 State Quarters, all Clad: Massachusetts, Maryland, South Carolina, New Hampshire, and Virginia. One each of the five 50 State Quarters: Massachusetts, Maryland, South Carolina, New Hampshire, and Virginia. One case contains the Cent, Nickel, 90% Silver Dime, 90% Silver Half Dollar, and the new Sacagawea "Golden Dollar." Another case contains one each of the five 50 State Quarters, all 90% Silver: Massachusetts, Maryland, South Carolina, New Hampshire, and Virginia. Packaging: Two hard plastic cases inserted into a specially printed sleeve and accompanied by a Certificate of Authenticity. One case contains the Cent, Nickel, Clad Dime, Clad Half Dollar, and the new Sacagawea "Golden Dollar." Another case contains one each of the five 50 State Quarters, all Clad: New York, North Carolina, Rhode Island, Vermont and Kentucky. One each of the five 50 State Quarters: New York, North Carolina, Rhode Island, Vermont and Kentucky. One case contains the Cent, Nickel, 90% Silver Dime, 90% Silver Half Dollar, and the new Sacagawea "Golden Dollar." Another case contains one each of the five 50 State Quarters, all 90% Silver: New York, North Carolina, Rhode Island, Vermont and Kentucky. One each of the five 50 State Quarters: Tennessee, Ohio, Louisiana, Indiana and Mississippi. One case contains the Cent, Nickel, 90% Silver Dime, 90% Silver Half Dollar, and the new Sacagawea "Golden Dollar." Another case contains one each of the five 50 State Quarters, all 90% Silver: Tennessee, Ohio, Louisiana, Indiana and Mississippi. One case contains the Cent, Nickel, Clad Dime, Clad Half Dollar, and the new Sacagawea "Golden Dollar." Another case contains one each of the five 50 State Quarters, all Clad: Illinois, Alabama, Maine, Missouri and Arkansas. One each of the five 50 State Quarters: Illinois, Alabama, Maine, Missouri and Arkansas. One case contains the Cent, Nickel, 90% Silver Dime, 90% Silver Half Dollar, and the new Sacagawea "Golden Dollar." Another case contains one each of the five 50 State Quarters, all 90% Silver: Illinois, Alabama, Maine, Missouri and Arkansas. One case contains the Cent, Two Nickels, Clad Dime, Clad Half Dollar, and the new Sacagawea "Golden Dollar." Another case contains one each of the five 50 State Quarters, all Clad: Michigan, Florida, Texas, Iowa and Wisconsin. One each of the five 50 State Quarters: Michigan, Florida, Texas, Iowa and Wisconsin. One each of the five 50 Silver State Quarters: Michigan, Florida, Texas, Iowa and Wisconsin. One case contains the Cent, Two Nickels, 90% Silver Dime, 90% Silver Half Dollar, and the new Sacagawea "Golden Dollar." Another case contains one each of the five 50 State Quarters, all 90% Silver: Michigan, Florida, Texas, Iowa and Wisconsin. One case contains the Cent, Two Nickels, Clad Dime, Clad Half Dollar, and the new Sacagawea "Golden Dollar." Another case contains one each of the five 50 State Quarters, all Clad: California, Minnesota, Oregon, Kansas and West Virginia. One each of the five 50 State Quarters: California, Minnesota, Oregon, Kansas and West Virginia. One each of the five 50 Silver State Quarters: California, Minnesota, Oregon, Kansas and West Virginia. One case contains the Cent, Two Nickels, 90% Silver Dime, 90% Silver Half Dollar, and the new Sacagawea "Golden Dollar." Another case contains one each of the five 50 State Quarters, all 90% Silver: California, Minnesota, Oregon, Kansas and West Virginia. One case contains the Cent, Nickel, Clad Dime, Clad Half Dollar, and the new Sacagawea "Golden Dollar." Another case contains one each of the five 50 State Quarters, all Clad: Nevada, Nebraska, Colorado, North Dakota and South Dakota. One each of the five 50 State Quarters: Nevada, Nebraska, Colorado, North Dakota and South Dakota. One each of the five 50 Silver State Quarters: Nevada, Nebraska, Colorado, North Dakota and South Dakota. One case contains the Cent, Nickel, 90% Silver Dime, 90% Silver Half Dollar, and the new Sacagawea "Golden Dollar." Another case contains one each of the five 50 State Quarters, all 90% Silver: Nevada, Nebraska, Colorado, North Dakota and South Dakota. One case contains the Washington, Adams, Jefferson and Madison Presidential Dollars. One case contains the Cent, Nickel, Clad Dime, Clad Half Dollar, and the new Sacagawea "Golden Dollar." Another case contains one each of the five 50 State Quarters, all Clad: Montana, Washington, Idaho, Wyoming and Utah. Another case contains the Washington, Adams, Jefferson and Madison Dollars. Packaging: Three hard plastic cases inserted into specially printed sleeves and accompanied by a Certificate of Authenticity. One each of the five 50 State Quarters: Montana, Washington, Idaho, Wyoming and Utah. One each of the five 50 Silver State Quarters: Montana, Washington, Idaho, Wyoming and Utah. One case contains the Cent, Nickel, 90% Silver Dime, 90% Silver Half Dollar, and the new Sacagawea "Golden Dollar." Another case contains one each of the five 50 State Quarters, all 90% Silver: Montana, Washington, Idaho, Wyoming and Utah. Another case contains the Washington, Adams, Jefferson and Madison Dollars. Packaging: Three hard plastic cases inserted into a specially printed sleeve and accompanied by a Certificate of Authenticity. 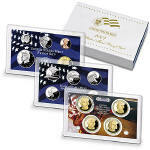 One case contains the James Monroe, John Quincy Adams, Andrew Jackson, and Martin Van Buren Presidential Dollars. One case contains the Cent, Nickel, Clad Dime, Clad Half Dollar, and the new Sacagawea "Golden Dollar." Another case contains one each of the five 50 State Quarters, all Clad: Oklahoma, New Mexico, Arizona, Alaska and Hawaii. Another case contains the John Quincy Adams, Andrew Jackson, and Martin Van Buren Dollars. One each of the five 50 State Quarters: Oklahoma, New Mexico, Arizona, Alaska and Hawaii. One each of the five 50 Silver State Quarters: Oklahoma, New Mexico, Arizona, Alaska and Hawaii. One case contains the Cent, Nickel, 90% Silver Dime, 90% Silver Half Dollar, and the new Sacagawea "Golden Dollar." Another case contains one each of the five 50 State Quarters, all 90% Silver: Oklahoma, New Mexico, Arizona, Alaska and Hawaii. Another case contains the John Quincy Adams, Andrew Jackson, and Martin Van Buren Dollars. One case contains Harrison $1, Tyler $1, Polk $1 and Taylor $1 Presidential Dollars. Packaging: Four hard plastic cases inserted into specially printed sleeves and accompanied by a Certificate of Authenticity. Coins included: DC quarter, Puerto Rico quarter, Guam quarter, American Samoa quarter, US Virgin Islands quarter and Northern Mariana Islands quarter. Silver Coins included: DC quarter, Puerto Rico quarter, Guam quarter, American Samoa quarter, US Virgin Islands quarter and Northern Mariana Islands quarter. One case contains Millard Fillmore $1, Franklin Pierce $1, James Buchanan $1 and Abraham Lincoln $1 Presidential Dollars. Coins included: Hot Springs, Yellowstone, Yosemite, Grand Canyon and Mount Hood quarters. Silver Coins included: Hot Springs, Yellowstone, Yosemite, Grand Canyon and Mount Hood quarters.